Garage Door Repair Corona. The exterior of ones home is, without a doubt, one of the most important factors in determining it’s beauty and it’s value, in terms of curb appeal. For that reason the elements that make up the exterior, especially the curb view, are among the most important consideration that the home owner should have, when it comes to home improvements. Among these elements the most notable, simply due to its large size in comparison with other elements, is the garage door. These days the garage door does more than simply secure and isolate the garage space from the outside. It also has the ability to set the tone for the entire rest of the house’s visual theme. Choosing the right garage door will not only have an affect on the security and convenience of your homes, but also its overall exterior look and feel. Best Choice for Garage Door Repair Corona CA. A garage door is a necessity in many homes, and can be imperative to the overall safety of a house. A broken or malfunctioning garage door leaves you and your family vulnerable to burglars or trespassers, who now are able to gain access to your car, garage, and even house. Broken garage doors can damage your property or even cause bodily damage to you and your loved ones. Furthermore, having a broken garage door is an annoying inconvenience and interferes with your day-to-day schedule. That is why having your garage door up-to-date and running smoothly is so essential. For a contemporary, sophisticated look, you can opt for aluminum and glass garage doors. Aluminum frames come in a range of colors while there are many options when it comes to glass such as clear, tinted and obscure. Though aluminum garage doors are maintenance free, they are not suitable for places with extreme temperatures since they do not have enough insulation. Chapman Garage Door Repair Corona CA was founded and still operates on one simple principle: be honest. Do what you say you’re going to do. Be on time, or at least notify the customer in the rare event you’re running late. Do the same level of work that you would do on your own home. If the customer isn’t happy with something, make it right with them. This is our priority, and we stand by it. Our customer service is also well-known for our technicians’ expertise and professionalism. Your experts for Garage Door Repair Corona CA will help you choose the best garage doors to complement the style of your home. Garage Door Repair Corona CA, to have the functionality you desire, and to also fit your budget. We put our customers first. The sun the moon and the stars, Chapman Garage Door has what your looking for. A Chapman Garage Door Repair is the perfect gift for anyone in your family, young and old alike. Christmas is coming soon. Remember to stock up on plenty of Chapman Garage Door. You never know when you may have unexpected company for the holidays. Chapman Garage Door Repair comes in a variety of colors. If you are shopping for a loved one, come in and see what we’ve got. You’ll save a bundle of money and you’ll have fun, too. At Chapman Garage Door Repair Corona CA, we know garage door repair in Corona CA! Ours is a well-established and reputable company. We have been in business since 2004. We are and always have been family owned and operated, and we bring a wealth of knowledge and experience about garage door openers and the installation and repair of garage doors to this business. Whether you require torsion spring repair, a tune-up or an adjustment for an existing door or you’re looking to give your home a whole new look, our experienced and professional staff is ready and able to help out any situation. Chapman Garage Door Repair Corona CA offers several, premium brands. We offer a variety of styles that suit different tastes. For the home owner that wants a garage door with a rustic flare, it has a well established, handmade look that will set your garage apart from the rest of the neighborhood. On the other hand, if you are more concerned with a garage that will last for years on end without any hassle, Garage Door Repair Corona CA is the one for you. It is insulated, all-metal, and to top it all off, maintenance free. Lastly, Garage Door Repair Corona CA is a favorite among homeowners who want to have options. This garage door not only allows you to section off your carport, it also raises overhead to give you the space you need in other situations. You can be sure that nobody can beat our prices. Try Chapman Garage Door for all your garage door repair Corona CA needs in. Chapman Garage Door has been proudly servicing our client’s needs for garage doors in Corona CA for nearly 20 years. We are a full-service Corona CA garage door repair company who can cater to all of your garage door repair needs, whether that is garage door repair, garage door parts replacement, or new garage door openers. Our ultimate goal is and has always been to provide you with the best quality garage door products and services in Corona CA and we will always offer you the lowest price, at the same time meeting your highest expectations. We take care of everything from garage door spring repair and replacement of springs to just a good old fashion tune-up. When you have a garage door issue you want to ensure that you get a good rate on the repairs that need to be done. Here at Chapman Garage Door we understand that you want to save money on your garage door repair problems. If you are in the market for a new garage door, contact us. We will pay a visit to your home and give you garage door options that meet your desires, home construction needs, and budget. We have a full selection of wood, wood composite, and steel doors available to give you an array of attractive choices. Our fast, professional service lets you give your home and exterior makeover that will boost its value. We also offer a supply of garage door openers and can professionally install them in less than one day. If you need Garage Door Repair Corona CA, you should turn to Chapman Garage Door. We can visit your home promptly and restore your garage door to good working condition in a very short time. We also recognize that Garage Door Repair Corona CA often presents an additional, often unexpected cost for homeowners. As a result, we are dedicated to offering competitive pricing, and exceptional technical service, and back up all our work with a guarantee. We know the pride you take in your home and are committed to helping you protect and maximize your investment in your property. Whether you need a small job, such as a hardware upgrade, or a complete new door, Chapman Garage Door can deliver. We also provide garage door spring repair and replacement for Corona CA homeowners. Garage door repair in Corona CA is being performed by professional technicians at Chapman Garage Door. We know that you have varying questions to ask and we are always happy to help you get the answers you need. We will never take money from you unnecessarily and will always advise you if new parts are required rather than going to the expense of a new garage door. And if you do need garage door parts, including garage door springs, then we can assist you with making the correct choices. Chapman Garage Door has a professional team of highly trained technicians. Without question, we are some of the leading experts of garage door repair in Garage Door Repair Corona CA. Our technicians arrive at every service call with a fully stocked truck, containing all the parts and tools they need to get each job done quickly and safely. We are licensed contractors in Garage Door Repair Corona CA, so you can trust that you will receive top-quality repairs from the experts at Chapman Garage Door. Many homeowners never think much about their garage doors, unless there is a problem. 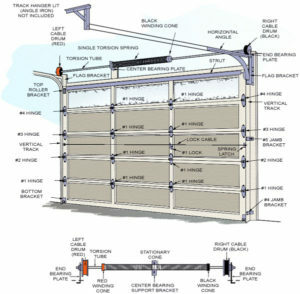 However, garage doors are complicated mechanical moving parts, which feature springs under high tension to operate. In addition, many modern garage door openers are electric-powered. When a garage door suddenly stops functioning, the door can get stuck and trap your vehicle inside. Broken doors can create serious hazards to your property or your loved ones. Homeowners should treat garage door issues as a major home emergency and never take on problem diagnostics or repairs themselves. The best way to prevent sudden, disruptive garage door malfunctions is to have your door inspected on a regular basis. Homeowners in Corona CA can turn to Chapman Garage Door Repair for a no-cost garage door inspection. We offer this valuable service to our customer free of charge, because we want to keep your family safe and prevent unavoidable damage to your home. Broken garage doors are more than just an inconvenience. They can be dangerous. Most likely, your garage door is the largest moving part of your home. If it malfunctions, you should seek automatic garage door repair right away to avoid any physical damage to you or your property. At Chapman Garage Door, we provide our Corona CA customers with the full spectrum of repairs from hardware replacement to complete garage door replacement. Our expert team of skilled mechanics and technicians can repair any part of your automatic garage door. In addition, we offer garage door spring repair and replacement. We also repair cables, pulleys, rollers, hinges, openers, and more. Plus, we can complete most repairs to automatic garage doors on the same day you call us. If you’re shopping for a replacement door, you can rely on Chapman Garage Door for the best selection at the most competitive pricing. We offer wood, wood composite, and steel doors to meet all of your home upgrade needs. In addition, we offer an array of parts for our customers who want to take on Garage Door Repair Corona CA themselves. Whether you need same-day garage repair, parts, or want to give your home a whole new look with an attractive new garage door, Chapman Garage Door is your #1 resource. Contact Garage Door Repair Corona CA today. When you need garage doors, parts, or repair, you should contact Chapman Garage Door, a premier Garage Door Repair Corona CA contractor for over 20 years. We bring our decades of expertise to every customer we serve and back up our dedication to quality workmanship with a guarantee. Contact us at Chapman Garage Door to learn more about our products and services. While a do-it-yourself approach to installing and repairing can be very helpful at times, it is still fraught with a lot of potential risks. First, if the person does not know the basics of garage door upkeep and setting-up, the door could be damaged or wrecked in the process. With these doors being heavy and sensitive items, they will certainly require the touch of a professional technician who can be found at Chapman Garage Door Repair Corona CA. You can rely on us to complete your garage door spring replacement. We have a professional team trained in all aspects of garage door spring repair. When you call Chapman Garage Door, we dispatch one of our skilled technicians to your home in Corona CA to perform your garage spring repair. Our technician arrives in a fully stocked truck, which means we have the parts and tools on hand to repair your garage door spring. We know that malfunctioning garage door is an inconvenience, and also a safety hazard, so we aim to repair or replace garage springs as efficiently as possible. Although you may feel like spring issues are a unique problem, you should know that garage door spring replacement is very common. Your garage door springs support the entire weight of your door, which makes them likely candidates for eventual repair. In addition, they tighten and loosen each time you use your garage door. The springs, which are wound under pressure, support your garage door every time it lifts and opens. However, garage door spring replacement is a lengthy and often hazardous process, which requires specialized tools. Turning to experts for professional garage door spring repair is a far better idea. You can contact the professionals at Chapman Garage Door Repair Corona CA for complete garage spring repair. Turning to experts for professional garage door spring repair is a far better idea. Chapman Garage Door is a licensed Corona CA contractor. We back up all our work with a workmanship guarantee. Plus, we have almost 20 years of specific expertise in garage doors, which makes us true experts in our area of focus. We are the leading experts in Garage Door Repair Corona CA residents turn to for parts, service, repairs, and new garage door installations. When you are ready to review garage door styles and choose a new door for your home, you can count on our professional team at Chapman Garage Door Repair. At Chapman Garage Door Repair Corona CA, we know it is important to resolve garage door repair issues for our customers as quickly as possible. Malfunctioning garage doors are inconvenient and potentially dangerous. Why risk damage to your property or injury to yourself, your loved ones, or guests from a faulty garage door? Contact Chapman Garage Door right away. We offer prompt and professional Garage Door Repair Corona CA. In addition, we offer competitive pricing and a work guarantee, so that you can rest assured that your money is being wisely spent. I change torsion springs for $195 total cost. That’s crazy cheap. Some companies charge $500-$600 for the same spring repair. We are a solid, family owned business. We have been in business since 2004 and have over 17 years experience. Our focus is on pleasing our customers. We also make it our mission to give our customers an excellent selection of Garage Door Repair Corona CA at great prices. We are an exceptional company with an excellent reputation in and around Corona CA for over ten years. This is why supreme customer satisfaction is so very important to us. Reputation means everything when it comes to a business. The first thing that you need to know is what makes our particular company so sought out and highly regarded in the area. This is a family owned and operated business that has been turning out satisfied customers for over a decade. Our experience boasts over 20 years working within the industry. The service within the Corona CA and surrounding neighborhoods has been a large part of our success and loyal customer base over the past 20 years. Whether the problem is a broken spring, hinge, cable, roller, or drum, we will solve your garage door problem. Simply call your expert company for Garage Door Repair Corona CA. Our expert technicians will diagnose the problems and repair or replace the damaged parts in no time at all. You can trust our garage door repair services. We are the best choice for commercial Garage Door Repair Corona CA. After our tech takes a look at your existing garage door, the next thing which he will do for you is help you to decide which type of door that you want. Once you have decided on the type of garage door repair, our technician discuss with you the budget that you were planning on working with. We will do our best to keep you on the budget that you choose and still get the garage door that you want. After you have decided on a ballpark price, he will show you a huge selection of parts and materials within your budget for you to choose from. We believe in excellent customer service. The first step is a FREE, on-site, estimate. We offer a tremendous selection from a variety of manufacturers. Make your house a home of distinction with a garage door repair from Chapman Garage Door. We work hard to make sure the we complete the job in a timely manner. We will not leave until your garage doors are operating smoothly and to your approval. The job and our support does not end at the completion of the job. We offer outstanding warranties to accompany our amazing service. We offer no stress, convenient and affordable service for all your Garage Door Repair Corona CA needs. Whether the style is contemporary or traditional, it will have trim, feature panels and other details. A garage door constructed with frame and panels will be sturdier than a garage door with decorative detailing. Some styles of Garage Door Repair Corona CA have glass paneling at the topmost panel. This makes them look attractive when you view them from the street. The glass at the top will also bring in enough light. Garage Door Repair Corona CA is here when you need us. Let Chapman Garage Door be your champion of garage door repair. We are your Garage Door Repair Corona CA company known for price, quality and service. Whether you need springs replaced, your door came off track or your opener is malfunctioning, we can assist you quickly and professionally. For those who are living in the Corona area, the choice is clear when it comes to selecting the repair company for your garage door.This whole process can get a little confusing at times, but do not worry, we will be right there to help you through it. We will guide you toward the best possible choice for your situation, the garage door repair that best fits your needs and your budget. When picking out Garage Door Repair Corona CA, there are few that offer as many choices as we do. Chapman Garage Door Repair offers a large variety of options of brands and materials and can also customize your garage doors to fit your unique needs. Choices typically include four folded, sliding, crane, fire, hangar and swinging commercial doors. Each of these doors has the ability to provide one or more benefits dependent on the needs of the business itself. If you need a commercial door that would provide security, you can benefit from a chain link and screen security door. The door is made with a break-away bottom section that will return to its normal position once kicked in, preventing someone from breaking in through the door. To add an extra security measure, the door can have a slide lock embedded right into it. A great feature of the energy efficient door is added insulation. Insulation is used to keep the temperature as close to being regulated as possible. This helps with the energy bill while protecting weather sensitive products that might be in the room. It also provides the ease of access needed when bringing things into and out of the room. Our business services all of Corona CA area as well as the surrounding area. If you are looking for Garage Door Repair Corona CA, your neighborhood is in our service area. We make shopping for garage door repair incredibly convenient for someone with even the busiest schedule. One of our highly trained and qualified technicians will come to your home to diagnose the problem. We can work around what time is best for you, not us. We do this because our customers and potential customers are so important to us. In doing this, it will give the tech the opportunity to see the Garage Door Repair Corona CA, which they will be working on. This is important so that we can see what we can and cannot do when it comes time to choosing your Garage Door Repair Corona CA. Your Expert is Chapman Garage Door. We offer superior service, exceptional selection and extraordinary quality. When its time to replace your garage door, you should go to a company that is reputable and experienced. Chapman Garage Door offers the best guarantee in the business. We offer a warranty on all of their installed garage doors. At Chapman Garage Door, we offer solid service as well as guaranteed satisfaction in choosing the right Garage Door Repair Corona CA and reap the benefits and advantages for a long time to come! Plus, as an established family business for Garage Door Repair Corona CA, we can guide you on everything from the selection to maintenance and make sure that your family’s safety, as well as the value for money you have put in is not compromised at any cost. Aluminum – This is an inexpensive option but has been largely replaced with sturdy doors and heavy duty and dent resistant panels. Some low budget aluminum doors are constructed using aluminum frames, with panels made of high-density polyethylene. They are still a popular choice, not only because of their cost, but also because they are lightweight. Steel – This is a low maintenance option and is the most popular choice for garage doors. It is sturdy, tough and inexpensive. However, the disadvantage with bare steel is that it rusts and dents. Therefore, it requires periodic touch ups. To minimize the maintenance, you can choose steel doors with 24 gauge panels or have a fiberglass overlay. These will be dent and rust resistant. Wood – The more traditional houses require wooden garage doors. They are expensive but are more charming and authentic than any other material. They will, however, need frequent refinishing and repainting. The biggest disadvantage of wooden garage doors is that they have a very short warranty of only one year. Our value pricing, high quality, and services are what people talk about most. One example, in particular, would be choosing the glass door option. This would come with an amazing benefit since it would allow the sun to shine through providing more light. At the same time, it would allow an individual to see directly through the door itself, providing the added benefit of visibility which is great for security. The weather will never be a concern with this option because this door will seal out all rain, snow, and exceedingly cold or hot temperatures. Besides the great modern look of this type of commercial garage door, it’s a great choice for businesses that want to showcase or promote their products, by making them visible at all times (such as for flowers, decorations, furniture, or even cars).